The Rev. Jesse L. Jackson Sr., founder of the Rainbow/PUSH Coalition, asserted that “communications issues are the civil rights issues of today” as he delivered the 30th Annual Everett C. Parker Ethics in Telecommunications Lecture in Washington today, Tuesday, September 25. The annual event, sponsored by the United Church of Christ’s Office of Communication, Inc. (OC Inc.), celebrates the legacy of the Rev. Dr. Parker, who launched the battle a half century ago to establish the public’s right to intervene in the awarding of broadcast licenses in the United States. This year attendees joined in marking Parker’s 100th birthday, which he will celebrate in January. • The growing digital divide into first class citizens, the digital "haves" and the second-class digital "have nots" Jackson noted that even though use of mobile devices is growing among young African-Americans, the devices can be used for playing "angry birds" but can’t be used “for research papers or filling out college applications,” and that many low income people do not have access to the Internet. • Broadcast ownership rates for women and minorities that still lag well behind the share of the population those persons represent, and consolidation of radio broadcasting that removes studios and their employees from the markets that they serve. He suggested resurrecting policies that helped underserved communities acquire media licenses. • The failure of several mainstream media networks to cover the plight of two Gambian-Americans who were among those threatened with death by the president of that African country. Jackson recently succeeded in winning the prisoners’ release. Rev. Jackson's remarks as prepared for delivery. The gathering also honored two other media justice advocates. Charles Benton, chairman of the board of Benton Foundation, received the Everett C. Parker Award in recognition of his many years of leadership and support for promoting the public interest in digital and traditional media. In his remarks, Benton highlighted what he said were the three guiding principles of Parker’s advocacy: work driven by an ethical foundation, patience, and a willingness to take on difficult challenges. Benton recalled how Parker had inspired him as he took over the helm of the foundation that his family had started. “As Everett was trying to give voice to the voiceless, I was trying to find my own voice in carrying on his work and building on the public service traditions of my family, especially through the Benton Foundation.” The text of Benton’s prepared remarks is available online. S. Jenell Trigg, chair of the Intellectual Property and New Media and technology Practice Group of Lerman Senter PLLC, received the Donald H. McGannon Award for her work to promote opportunities in telecommunications media for women and people of color. In her remarks, Trigg described how when she had been nervous about starting law school after pursuing a career in broadcasting, her mother had inspired her by telling her for the first time about the efforts of her grandmother, Lucy Carrington Cooke. Cooke fought segregation by challenging policies that prevented the school bus from travelling an extra three miles to pick up young African-American children. The case, Trigg noted, was one of the earliest handled by future Supreme Court Justice Thurgood Marshall. Shown above is an image of Rev. 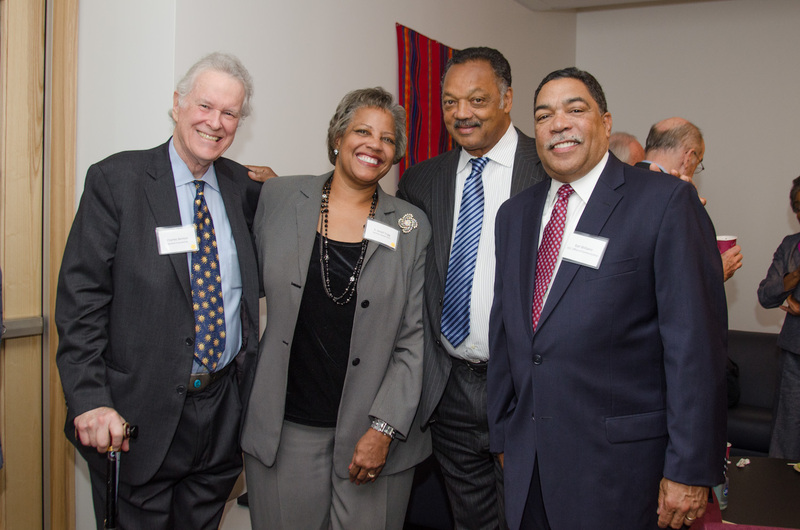 Jackson giving the 30th Annual Parker Lecture at First Congregational United Church of Christ in Washington, DC, and an image of the honorees (L to R): Charles Benton, S. Jenell Trigg, Rev. Jesse L. Jackson, Sr., and Earl Williams, UCC OC Inc. Chair. Photo credit: Liz Roll. 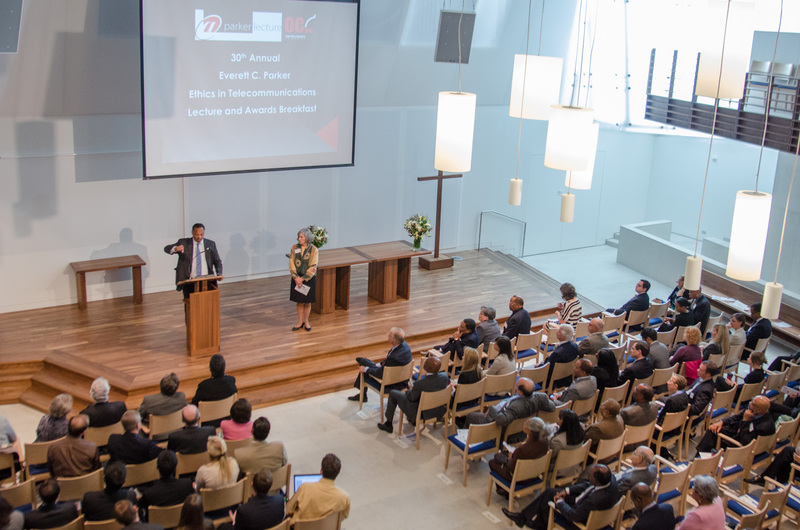 Our web site contains more information about the 2012 awards, honorees, and sponsors of this event as well as previous years' honorees and photos and video clips. The event is the only lecture in the country to examine telecommunications in the digital age from an ethical perspective. Since its founding in 1959, the Office of Communication of the United Church of Christ (OC Inc.) has been a leading force in the struggle to ensure that women, persons of color and low-income persons have equal access to ownership, production, employment, and decision making in media. OC, Inc.’s work grows out of the United Church of Christ’s historic commitment to civil rights, and its belief that social justice cannot be achieved without a media system that reflects the nation’s diverse histories and struggles. For more information on OC Inc., go to www.uccmediajustice.org. United Church of Christ Office of Communication, Inc.